Awbury was originally the summer home of the Cope family. Henry Cope, a Quaker shipping merchant, purchased Awbury in 1852 and named the estate after the village, Avebury, England, from which his family originally emigrated. Awbury soon became a year-round home for members of the extended Cope family. Various Victorian and Colonial Revival houses were built between 1860 and the 1920’s, forming a unique cultural landscape. Except for the Francis Cope House (1860), the Arboretum headquarters, all of these are privately owned. Concern for the preservation of this piece of open space led to the establishment of the Arboretum in 1916 by members of the Cope family, for use as an Arboretum for the “quiet enjoyment of nature” and for educational purposes. In 1985, the Awbury Arboretum Association was established as a not-for-profit corporation entrusted with promoting the well-being of the Arboretum for the benefit of the community. We continue to serve our community through a broad range of educational services. Today Awbury Arboretum is an extraordinary 55 acres of green space in the historic Germantown section of Philadelphia, and is the largest remaining island of open space in this part of the city. The Arboretum’s grounds include open meadows, ponds, woods, and lawns. Thousands of trees, many of them more than a century old, give visitors a chance to become acquainted with over 200 species, including a champion size River Birch (Betula nigra). Wildlife includes a variety of birds, squirrels, chipmunks, frogs, opossums, and rabbits. 1. The history of Awbury’s landscape and buildings. 2. Members of the Cope family who have lived at Awbury or nearby. 3. Life at Awbury since the mid nineteenth century. 4. Records of the City Parks Association. 5. Items relating to the history of Quakerism and Germantown. The Awbury Arboretum Archives is open to the public free of charge by appointment. Call or email to set up an appointment with an archivist. 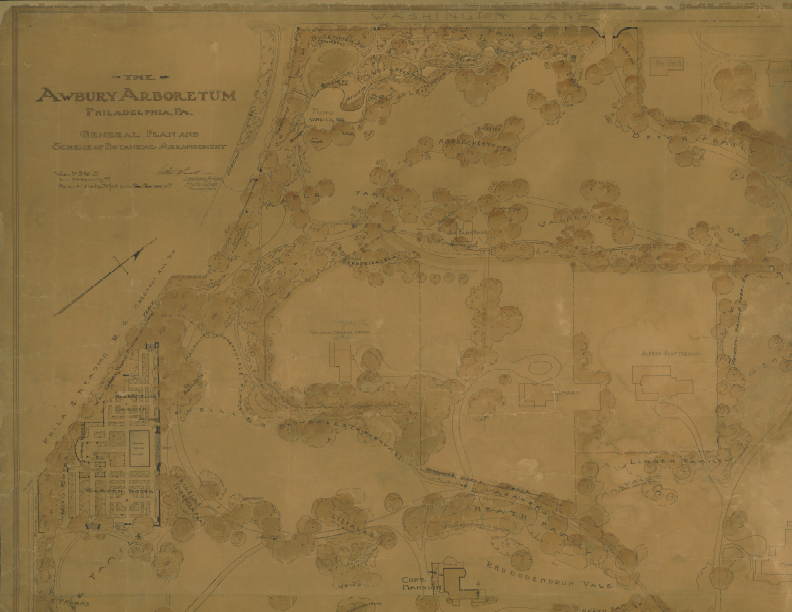 Awbury Arboretum also has an extensive online collection of archival information and pictures. Click here for our online archives. 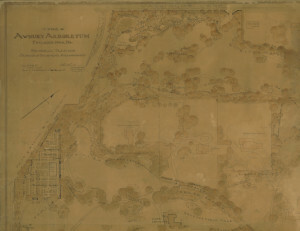 Awbury Arboretum, along with many of the extended Cope family estates, is recognized as both a National Historic District and a Philadelphia Historical Commission Historic District. Click here to learn more about the Awbury historic district & homes. In celebration its 2016 centennial, Awbury Arboretum republished Edwin C. Jellett’s 1903 weekly “A Flora of Germantown” articles. Jellett wandered throughout Northwest Philadelphia, recording plants in bloom, noting changes in the flora from previous decade, and referencing local history. Click here to access The Country in the City: Natural History in Northwest Philadelphia.